Olivery Genuine Leather Valet Jaguar Keychain Detachable Elegant Key Chain 3 Key Rings (Black) | What Should I Say? PREMIUM DETACHABLE LEATHER KEY CHAIN: PREMIUM QUALITY, PREMIUM BUILD! Are you looking for something stylish to store your keys? an ideal all-purpose gift? Do you find traditional key rings are too dull and out of style? Our Exquisite Detachable Leather Key Chain is The Perfect Product for You! 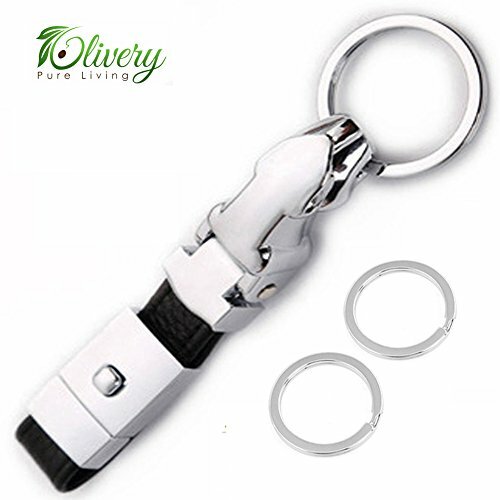 The keychain is manufactured from high quality, environmental friendly zinc alloy and polished for a shining mirrored finish ensuring maximum strength. Unlike other products on the market, the leather is 100% first layer full grain leather rather than cheap plastic leather substitutes which easily weakens and frays after repeated use. Full grain leather is well known for preserving natural beauty with superior durability and air permeability. This impeccable style showcases an intricately detailed Jaguar/Cheetah head. Generously sized, it is ultra-durable and strong. The package also comes with 2 bonus key rings for storing more keys. It is packaged in a beautiful gift box with secure foam padding for protection against scuffs and knocks, ensuring its polished finish arrives in perfect condition. This high profile and sophisticated key chain is guaranteed to make an ideal gift for all occasions and delivered in an elegant presentation box, all you need is to wrap. We offer LIFETIME WARRANTY! If a product ever fails due to a manufacturing defect, we will repair or replace without any question asked. Whether you are looking for a key chain for yourself or a perfect gift for your loved ones, if you demand superior quality and affordable price, click "Add to Cart" now! Olivery is a Proud Registered Brand With Amazon! Satisfaction Guarantee - When you order today, you're protected by LIFETIME WARRANTY of the product and world class customer service! Manufacturer: Olivery Pure Living Inc. Publisher: Olivery Pure Living Inc. Studio: Olivery Pure Living Inc. If you have any questions about this product by Olivery, contact us by completing and submitting the form below. If you are looking for a specif part number, please include it with your message.